Column vol.31 - race | Yamaha Motor Co., Ltd. It was Christmas of 2003. At the Yamaha Test Course in Fukuroi, Shizuoka Pref., about 15 minutes east of the Yamaha Motor headquarters, the sound of a starter turning over an engine could be heard. But the new engine that had just been mounted on two prototype bikes for the first time wasn't starting right away. As expected, the increased starting torque that this engine had been designed for was making it a bit tricky to start. When it did catch, it began purring with a different sound from the engines before it as two test riders took it out on the course. Coming back from the initial shakedown run in the cold December air, the two riders, Wataru Yoshikawa and Yoshihiko Fujiwara brought their machines to a stop in the garage. The first words the waiting engineers heard were, "I feel new potential in this engine." The engineers smiled. That was what they had been hoping to hear. 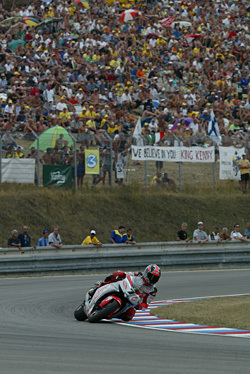 This moment marked the birth of the new YZR-M1 model "0WP3" that Yamaha had been developing for the 2004 MotoGP season. With the start of the MotoGP in 2002, Yamaha had introduced its first YZR-M1, which mounted an in-line-4 engine. That machine took a 3rd place in the 2002 season opener and went on to a final ranking of 2nd with two wins in the series. The following year, 2003, everyone in the Yamaha camp was looking forward to more success, but the Yamaha ace rider, Alex Barros, got injured in the opening round. After that, things just never got in gear for the Yamaha team, and when it was over, Yamaha had only managed one podium finish, a 3rd place at the French GP. That was the worst season record for Yamaha since it started competition in the pinnacle GP500 class back in 1973. At this time the rival's V5 engine factory machine was winning race after race. That was a machine that took advantage of the new MotoGP regulation, which set the same weight limit for machines with four and five cylinder engines. The 5-cylinder engine was a surprise move that the Yamaha engineers had never expected. Yamaha was being shut out of the competition and something had to be done about it. To compete against the V5 machines some were saying advocating going all the way to a V6. After some intense debate it was concluded that just doing the same thing that the competition had done would not guarantee victory, because the opponent was always progressing as well. Rather, Yamaha should be looking for the next breakthrough in its own field of expertise, which was building compact in-line-4 engines. During the 500cc GP road race era, there had been a large number of "highsiding" crashes that resulted when a front wheel that had begun to slip suddenly regained grip and sent the machine off balance. In the MotoGP era, however, the advances in electronic control systems had reduced the number of highside accidents. Instead, there were a growing number of crashes resulting from the front end going down. The Yamaha engineers had a feeling that tendency held the key to the future of machine development. The in-line-4 is said to have an advantage over the V4 for the purpose of achieving the desired front-wheel weight distribution. This is because the fore-aft length of the in-line-4 can be made shorter, thus increasing design freedom with regard to the engine mounting position, fuel tank position and the layout of the exhaust system. The entire Yamaha design and engineering team applied themselves to the task of developing these unique merits of the in-line-4. At the official tests at Sepang at the end of January 2004, newly-signed rider Valentino Rossi described the YZR-M1 engine with the crossplane crankshaft as "sweet"
The specific aim was to create an engine that produced linear torque output in response to rider input from throttle operation. In particular, this meant enabling response to throttle operation that is smooth and helps maintain machine stability even in situations where it is fully banked when exiting a corner, which is essentially when the machine is in its least stable state. Torque generated by the engine does not necessarily match the degree of throttle opening. Especially high-revving engines like those used in MotoGP, inertial torque from the reciprocating motion of pistons and connecting rods is generated independently without relation to throttle operation at times. For riders trying to control torque via the throttle, this produced unhelpful torque "noise." Giving the crankshaft a 90-degree axial adjustment in the middle, however, cancels out this inertia torque by re-directing it internally into the engine. This results in torque that is produced purely from the combustion force in the cylinders without the bothersome inertial torque element. This is why the 90-degree crank, crossplane crankshaft was adopted and became a weapon in the new in-line 4-cylinder engine. The 0WP3 was subjected to further track testing and repeated adjustments and at the end of January 2004, just one month after the initial shakedown test at Fukuroi, it was taken to the official MotoGP tests at Sepang in Malaysia. Valentino Rossi, riding it for the first time, praised it as a "Sweet" engine. He posted a win at the opening race of the season in South Africa and recorded eight wins from then until the 15th race in Australia. 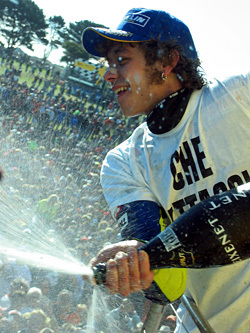 Rossi clinched the championship title at that Australian GP with one round still remaining in the series. For Yamaha this represented its 11th Rider title in the pinnacle class after a dry spell of 12 years since Wayne Rainey had won the title in 1992. Subsequently the crossplane crankshaft technology was fed back into a production model, the YZF-R1, and in 2009 contributed to Ben Spies winning the World Superbike Championship.